Do You Need Dental Implants in Atlanta? Periodontal disease is the number one cause of adult tooth loss. Missing teeth can impair your appearance and ability to function normally. Fortunately, Dr. Pate offers restoration of dental implants — a comfortable prosthetic to restore your smile. Comfort: Dental implants are planted into your jaw bone and serve as the root of your missing tooth. 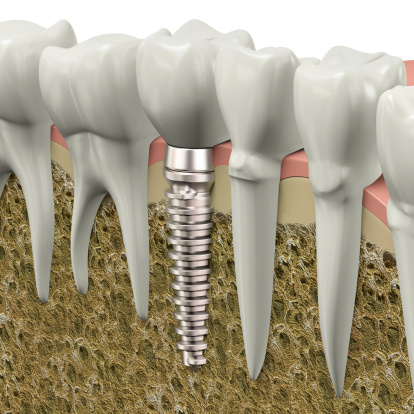 As your mouth heals, your bone will grow around the implant post, creating a comfortable and sturdy finish. Durability: Since dental implants are surgically placed in your mouth, they will stay in place without slipping and sliding. The prosthetic crown attached to your implant is strong enough to withstand everyday wear and tear. Space: With missing teeth, your adjacent teeth have the potential to shift into the open gap, creating bite misalignments. Dental implants, however, sit in the same spot where your tooth once was, holding proper spacing and alignment. Independent: With bridges, for example, your surrounding teeth must be strong enough to support a crown. Dental implants don’t rely on other teeth to function properly. Natural: The replacement tooth will look like your natural teeth. And since implants sit in the missing spot, they will feel and function like natural teeth, as well! Consistency: Dentures can be irritating and may require adjustments. Implants, on the other hand, won’t rub against your gums or change with the shape of your mouth. They also stimulate your jawbone tissue, avoiding further deterioration that could cause additional teeth to fall out. At your consultation with Dr. Pate, your Atlanta dentist will evaluate your situation and determine if you might be a candidate for dental implants. Call Dentistry in Buckhead at (404) 266-9424 to schedule an appointment. We welcome patients from Buckhead, Sandy Springs, Lenox, Brookhaven, Atlanta, and the nearby areas. Have Questions? We've Got the Answers. Complete the form below to send us an email, or reach us at contactus@patedds.com.